When our intrepid user research team goes into the field and observes Firefox users in the wild, they find that users have all sorts of creative solutions to do things that the browser doesn’t already do, like email links and screenshots to themselves and others as a way to get things done. We want Firefox to be the absolute best way to get things done, so we stuffed a ton of new features into today’s release. The web is personal – often the site you visit, whether it’s your social network of choice or a proposed travel itinerary with a funny ad on it, is not something that you can easily save or share. With Screenshots, saving and sharing the things you see online is as easy as a click. Screenshots started as Page Shot in Test Pilot – a program that allows users to test drive potential new features for Firefox. The feature proved its worth quickly as we watched it become the most downloaded experiment in the history of Test Pilot. To make the Screenshots experience even better, our team dedicated time to reviewing usability tests and event metrics to better understand how the feature was being used. With that in mind, Firefox Screenshots allows you to take, save and share screenshots – all without leaving your browser. First, Screenshots lets you capture a screen within your Firefox browser without downloading any new software. Either click and drag to grab the content you want, or because Screenshots is web aware, let Screenshots do it for you. Just hover over the area you want to grab, let Screenshots automatically identify the outline of the area you’re looking at, then click. 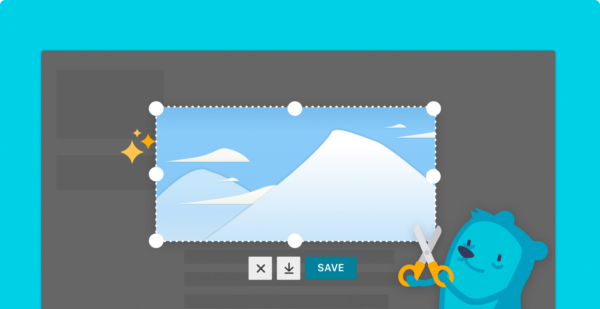 You can choose the screenshots you want to save, and easily access your saved screenshots through a toolbar in your browser. Firefox automatically stores your screenshots in the cloud for two weeks, but you can change the expiration date or delete them anytime from your online library. You can also easily share your screenshots as a link with anyone, no matter what device they’re on or browser they use – all without having to click or save before you share. Try it out and discover what our Test Pilots loved so much about the feature. Firefox is giving users a quicker way to share content between all of your mobile and desktop devices. It’s called Send Tabs. 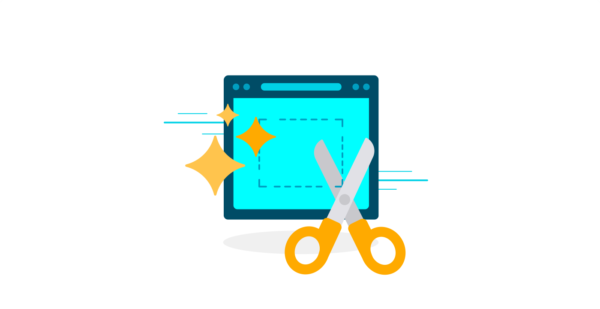 Send Tabs provides the quickest route for users to instantly send any web page to and from your desktop, mobile browser, or any mobile app. This means you don’t have to email yourself links anymore! And your data is encrypted end-to-end. Even Mozilla can’t decrypt it. Whether you’re making a new online purchase or making a donation to a relief organization, filling out forms is tedious. Starting in the US, we’ll be gradually rolling out this feature to all your desktop devices to make it easier to fill out most address forms. 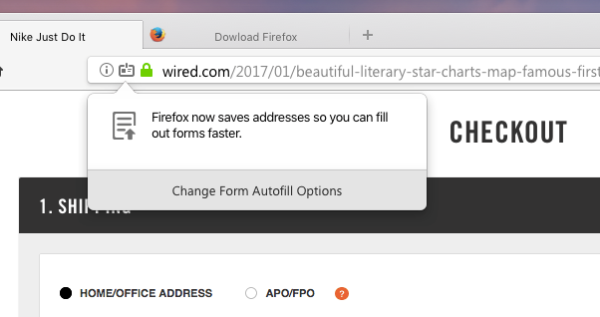 Firefox now allows users to complete online forms with multiple input fields like the address fields on your favorite shopping site, by simply selecting a suggestion from the autocomplete dropdown. When users first fill in a form on a compatible website, Firefox automatically saves the field data to “Saved Addresses” under Options (Preferences) so users can reuse such information with forms on new websites. Users can also save multiple addresses, so you can add work and home addresses of friends and family. Saved addresses can be synced to all your desktop devices. Download this latest version of Firefox to experience these new and improved updates. With this latest release, we’re getting one step closer to the fastest Firefox yet – Firefox Quantum coming November 14. If you can’t wait until then try Firefox Quantum in Beta. Either way don’t forget to look for the new Screenshots icon on your toolbar and try it out for yourself!